The Deer Park is a bar and restaurant that has been in the heart of Roundhay for as long as I can remember. It’s undergone a few changes over the years, but a recent renovation is certainly the best yet. Walking through the door, I was transported away from the busy main road of Street Lane and in to a calm, cosy, yet modern atmosphere. The décor has a luxurious yet relaxed feel and there is a peaceful area near the bar with beautiful, comfy chairs where you could relax with a drink. This is where my husband and I chose to begin the evening, slumping in our armchairs by the window with a gin and tonic. Bliss. 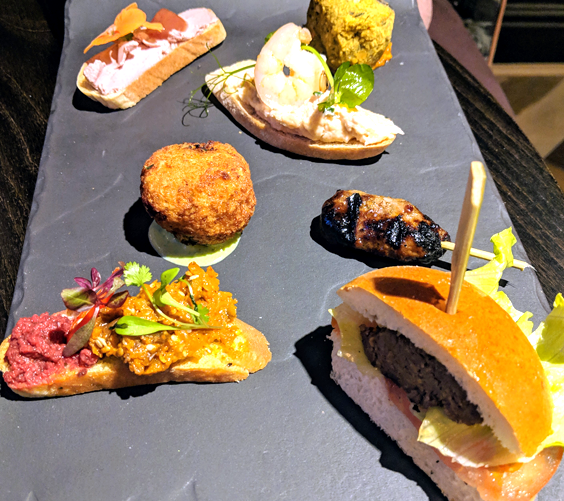 We were given a selection of canapés to try which we were told were some of the nicest things from the menu. This included delights such as burger, lamb kofta, fishcake and falafel. All were very tasty, particularly the kofta which features in both the starters and mains on the menu. When we had finished our drinks, we were shown to our table which happened to be in the newly built conservatory area. Built just seven days previously, my husband and I were the first guests to experience the new and very fancy conservatory. The area is decorated in a sleek and modern way, with light wood flooring, dark modern furniture accented by fluffy pink rugs over the backs of chairs. It was explained to us that the conservatory is weather intelligent and the roof and windows respond to the weather! Impressive! The staff were attentive and checked whether we wanted the heaters on or not and were happy to oblige if we wanted the heat turning up or down. We ordered more drinks, another gin for my husband and a ‘Victoria’s Secret’ for me. This was an alcohol free sparkling passion fruit-flavoured drink that looks and tastes every bit the cocktail. Delicious and only £3.95. The Deer Park has a good selection of alcohol free drinks including cocktails, tonic mixes and alcohol-free cider. Perfect for the designated driver. They also have a large car park. To start, I ordered tempura mushrooms that came with a soy, ginger and garlic dip (£6.95). My husband ordered the scallops of the day which were pan fried and served with walnut puree and apple (POA). 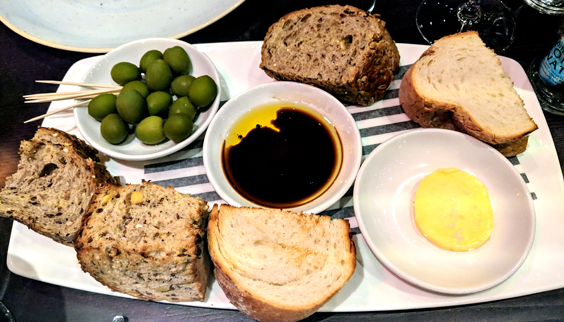 We also got some artisan rustic breads and olives that came with butter and oil with balsamic vinegar (£6.25). Many of the starter options are cheese and seafood which is quite problematic if you can’t eat those things for whatever reason. That said, they are accredited by The Vegan Society and have a separate vegan menu. The portion sizes are large so we were already feeling quite full after the starters. The mushrooms were varied, not your standard household mushrooms. The accompanying soy, ginger and lime sauce was beautiful, so much so that I ended up dipping bread in it when I had no mushrooms left. The scallops were well cooked but the walnut puree and apple accompaniment was a tad bland. The breads were nice and the olives were of good quality. For main, I ordered Buttermilk Southern Fried Chicken stuffed with Nduja Sausage. This came with sweet potato fries, apple salad and lemon aioli (£15.50). 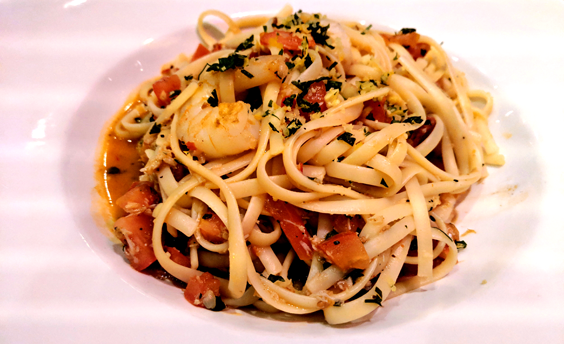 My husband ordered Prawn, Crab and Chorizo Linguine with White Wine, Tomatoes and Chilli (£13.95). 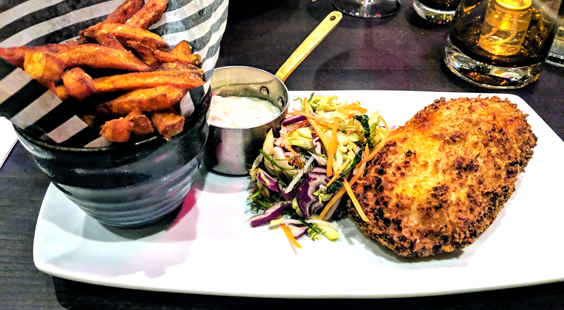 I’m not sure what I was expecting but I was surprised when the southern fried chicken arrived in the form of a large breaded Kiev. There wasn’t a large amount of Nduja in the middle and it took a while to find it – that said you don’t need a lot as the dish was quite spicy anyway. The sweet potato fries were nice and crisp and the apple salad was very tasty. The tangy freshness of the apple complemented the rich heaviness of the Kiev. Following tempura, the breaded Kiev was quite heavy, so next time I will be sure to choose more wisely. The linguine was also a large portion and well presented. It was very tasty but perhaps a little heavy on the garlic and chilli. After a rest we were ready for dessert. I ordered the Melting Chocolate and Peanut Bomb, filled with Sticky Toffee Pudding and Peanut Butter Cream and served with a hot caramel sauce and ice cream on the side (£7.95). My husband ordered the Blackcurrant Mousse on a biscuit base with mango and strawberries (£6.75). I loved the melting bomb dessert, and enjoyed the theatre of pouring the hot caramel sauce on and watching it melt. It was all really tasty but again quite heavy and rich. The presentation was beautiful with use of edible flowers. The blackcurrant mousse was light and delicious, the balance between sweet and tangy was just right. The Deer Park is now a terrific and relaxing dining experience for couples and groups alike. The portions are generous and value for money is excellent. I’ll certainly be back over the summer to watch that smart conservatory in action!